← 4 Weeks to go!!! I spent ages typing up an entry last week and saved it – but I’m blown if I can find where it saves it on here! So the count down is officially on with 31 days to go until I fly and 5 days until we can watch the boys in action the excitement continues in the Sparks household. In a bid to find more people that are going to share the excitement with I found out that Gullivers have started up a forum and so on their website. A blinking good idea in my opinion. It has all of the different tours that are going and when I looked down the list to see if Leopard Pink was there – low and behold the tour leader had started it off. I read it all very excited before I read the name and looked at the mini picture that had been put up as his profile picture. Blow me – Simon Jones former Team Manager for Bath 2 people ago (we had Haag after him and now Dave Guyan). How amusing but darned good news to be a Bath person. I sent him and email and introduced myself and he said that he had recognised my name off of the list of people on his tour. Now I am not too sure how good it is that my name precedes me here! (Hopefully it is because I worked in the shop and on the Supporters’ Club) I then emaiked Dani – the girl at Gullivers’ who I have had communication with in regards to my trip and asking inane questions – the amusement factor and the good choice of tour leader as he was Bath and she too confirmed that he recognised my name when looking down the list! AAAHHHH! Any hoo I also asked her to give me the rough demographics of the group (is that the right use of word?! – it sounds right in my head!) and found out that I am not the youngest and there are 40 on the group in total and quite a lot of friendship groups too so I was calmed by that I had visions of it being a Saga holiday or all couples. I can relax about that part now!!! On Thursday of last week – the 5 week mark, I had a parcel – an unidentified one as I have not been having an ebay craze as of late. 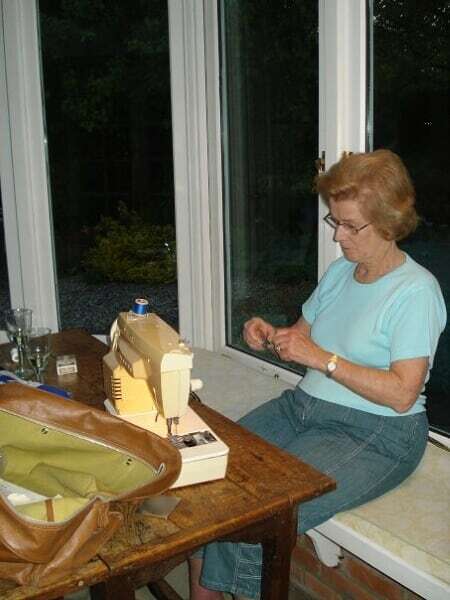 I went to Sylvia and Bob to go and collect it and I am not quite sure that Sheila was quite prepared for my reaction when I looked to see where it had come from and it had Leopard Pink on it – I knew it had to be all of my Gullivers’ stuff. They said 2 weeks before we depart so I was not expecting it just yet!! Cue ear piercing shrieks and lots of jumping up and down and I skipped back to the house to rapidly open every packet and put everything on – yes all at once. So There is a polo shirt (proper cotton one not the nasty material), a fleece – zip through, a waterproof jacket – zip through, ruck sack, swim bag type bag, baseball cap and a Berlitz Guide Book. I sat in them all for at least a couple of hours not really wanting to take them off, savouring the moment that I had waited so long for – things were finally real its not just a number anymore!!! I had to take them off in the end as I was ROASTING! So I am back at Mum and Dad’s this weekend – last one I reckon before I go away. I showed them all of the kit and they thought that I have purchased it all – I suppose I have in effect from going on the tour – but I explained it is what all Gullivers tourites get when they travel to the Lions with them! I also took the Lions Supporters Club Flag back with me and the 4 flags that I got off of the shop that were left over from the hand outs at the matches towards the end of the season. After tacking some of them together Mum and I (well I sort of helped!) 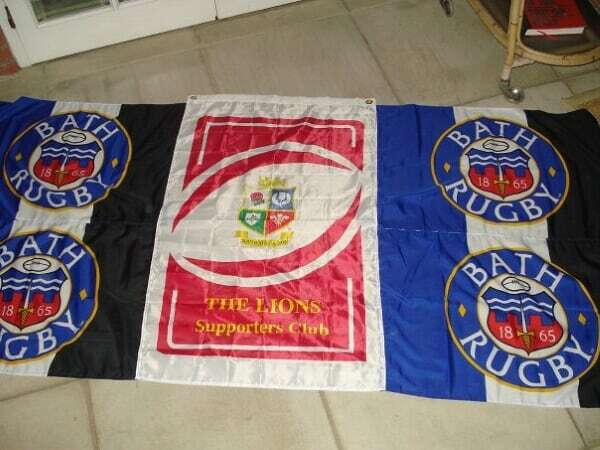 managed to get them all sown together so that I have the Lions one in the middle and two Bath flags on top of each other on either side (4 in total) I will upload a photo of it later. Its mahoosive! I will need to speak to Jimmer to find out where he got his clips from or I will buy a pack of pipe cleaners to tie it on to things!!! I managed to get on ebay as well some kids face paints in sticks which will hopefully be easier to put on than with a sponge – we will see, also they are small enough to put in the luggage!!! I need to start thinking about what to take Lauren and Juliet and Ant as thank you presents for having my to stay after the tour – I am spending approximately 5 days with each. I have a few ideas up my sleeve, the most important thing is that they are small so I am not stuck for space!!! Posted on May 25, 2009, in Lions Tour 2009. Bookmark the permalink. Leave a comment.